If you love to drive, you will love the 2016 BMW 340i. Forget about Nissan’s claim that it builds a 4-door sports car. Especially in new 340i guise, the BMW 3 Series is the real deal, an actual sports car equipped with four doors, thrilling to drive under almost every circumstance, and roomy enough for you and three other people. But is a 3 Series a luxury car? That’s debatable. Sold all around the world, the iconic 3 Series generates a quarter of BMW’s annual sales, making it the best known and best selling of the company’s Ultimate Driving Machines. That makes the 3 Series hugely important to BMW’s bottom line. If a 3 Series doesn’t exemplify the company’s standards for design, engineering, technological sophistication, and driving dynamics, then BMW risks everything. Last redesigned for the 2012 model year, this car is getting old. 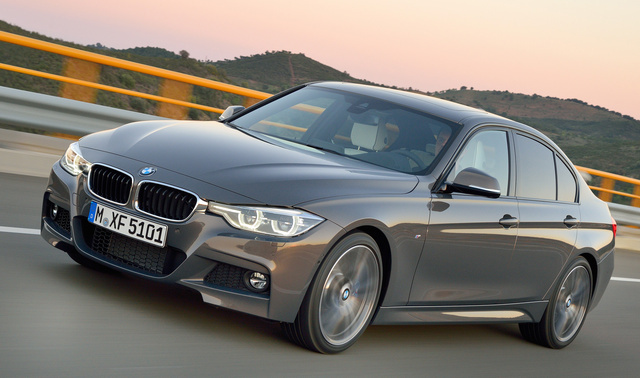 That’s why BMW has bestowed upon the 2016 3 Series a mid-life update. Mechanically, BMW tweaks just about everything, while at the same time giving the car technology improvements and minor styling changes. A new plug-in hybrid model also debuts, replacing the virtually ignored ActiveHybrid 3 model. 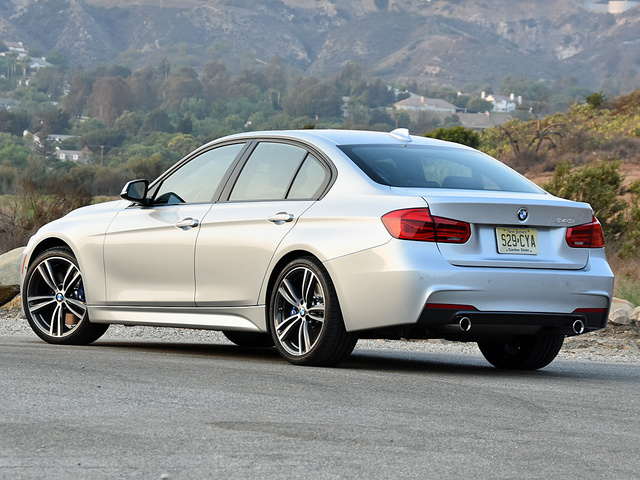 Continuing in sedan and station wagon body styles, the 2016 BMW 3 Series is offered in 320i, 328d, 330e, 330i, 340i, and M3 model series, each equipped with a unique engine and often accompanied by specific enhancements. Not all body styles are available in all configurations. Any 3 Series with “xDrive” in its name signals the presence of an all-wheel-drive (AWD) system. If you haven’t been keeping up with BMW news for the past few years, the former 3 Series coupe and convertible models now carry the 4 Series designation. They’re based on the 3 Series, but positioned slightly higher in terms of price if not performance. My test car was a BMW 340i sedan carrying a base price of $46,795. It was loaded with extras, the only free item a 6-speed manual gearbox to replace the standard 8-speed automatic transmission. Extra-cost options included Glacier Silver paint ($550), leather seats ($1,450), enhanced Bluetooth and smartphone integration ($350), and rear manual side window shades ($575). Several option packages were also installed on the test car, including the M Sport Package with 19-inch Wheels ($3,500), the Track Handling Package ($1,700), the Driver Assistance Package ($950), the Driver Assistance Plus Package ($1,700), the Technology Package ($2,750), the Cold Weather Package ($800), and the Lighting Package ($800). These equipment upgrades ballooned the window sticker to $61,920. Especially when painted silver, and especially in my suburban area northwest of Los Angeles, a BMW 3 Series is virtually invisible. This, actually, is a good thing, because if you’re buying a 3 Series for its intended purpose, you’re not going to want other motorists or law-enforcement officers to pay much attention to you. Attractive from some angles and unattractive from others, the 3 Series represents a collection of classic BMW design cues rendered in modern forms, salaciously stretched atop the car’s rear-wheel-drive (RWD) platform. Nobody is going to drool over the car’s details. Rather, it’s the proportions that get an enthusiast’s blood flowing. Purposeful but nowhere near plush, my test car’s interior featured leather upholstery, genuine metal trim, and no-nonsense instrumentation. Even when dressed up with brighter colors or more traditional finishes, this is not a car designed to coddle its occupants or to wow its owner with the latest in gee-whiz-bang technology. It is a tool, crafted for driving. Adjust your expectations accordingly. 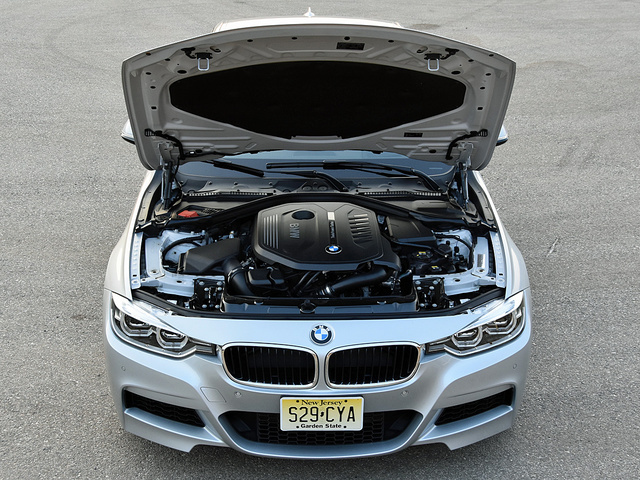 For 2016, BMW installs a new, lightweight, turbocharged 3.0-liter 6-cylinder engine in this version of the 3 Series, simultaneously changing the car’s nomenclature from 335i to 340i. The engine generates 320 horsepower at 5,500 rpm and 330 lb-ft of torque from 1,380 rpm to 5,000 rpm, and it includes an automatic engine stop/start system designed to help conserve fuel. Translated, this engine makes its peak torque or its peak horsepower across nearly the entire rev range. An 8-speed sport automatic transmission is standard, featuring paddle shifters and driving the car’s rear wheels. A 6-speed manual gearbox is a no-charge option, and xDrive AWD is available. Four driving modes alter the car’s performance character: Eco Pro, Comfort, Sport, and Sport+. 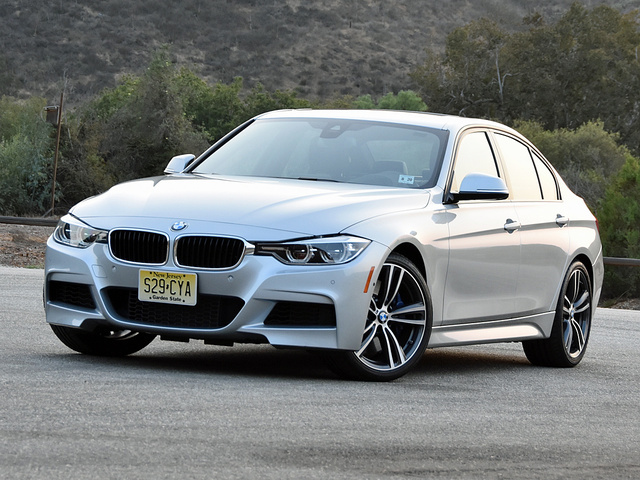 Believe it or not, the fastest version of the car is the 340i xDrive with the automatic transmission. BMW claims it will accelerate to 60 mph in 4.6 seconds. The slowest version of the car is the 340i with the 6-speed manual gearbox, which takes 4.9 seconds to hit 60 mph, according to BMW. You know what? I don’t care that my 340i was the slowest one of the bunch. The rush of power is addictive, as evidenced by my failure to match the EPA’s city fuel-economy rating of 20 mpg during a full week spent slinging the car to speed. Measured separately, and while driving like a responsible member of society, the 340i returned 22.4 mpg on my test loop, almost matching the EPA’s rating of 23 mpg in combined driving. BMW has also improved the transmissions, redesigned the electric steering, and upgraded the suspension for 2016. You see, when the current 3 Series first arrived for 2012, BMW purists complained that the car was getting too soft and felt too disconnected. They decided that perhaps BMW was losing its way, forgetting how to engineer an Ultimate Driving Machine. I’m not a 3 Series purist or expert, but yes, during previous drives of a 2012 and a 2014 model, the driving dynamics did not stand head-and-shoulders above the previous version of the Three, let alone competitors who were fast decoding BMW’s secret sauce. Based on my experience with this 340i, the changes for 2016 appear to be putting the 3 Series on the path to redemption. An alluring temptress that revs eagerly and swiftly to redline, the powerful new turbocharged 6-cylinder engine is creamy smooth and as tasty as sea-salted caramel. Shifting easily and naturally from gate to gate, the silken manual gearbox includes a delightful downshift rev-matching feature that masterfully substitutes for heel-and-toeing as you approach corners. Clutch take-up is perfectly weighted, too, making it easy to effortlessly launch the car, and the hill-hold feature is quite handy. When you’re not blasting away from intersections or around freeway on-ramps, your driver’s license is also endangered when you’re simply cruising down the highway. That’s because the 340i feels like it is traveling at half the indicated velocity at any given time. Be sure to use iDrive to set the speed warning feature. You’re going to need it. Put the 340i on a favorite back road and the car explodes out of corners, the rear end digging in and flinging the BMW toward the next kink in the pavement. The available adaptive M suspension tightens up in Sport mode, adding a stiffness that is not evident in Comfort mode. Either way, grip and balance are extraordinary, the car carrying unexpected amounts of speed into and through corners. Not quite telepathic in the way of older BMWs, the steering is nevertheless improved over last year’s car. Occasionally, the driver senses an unbecoming lightness on center, and I found it necessary to regularly feed the car minute corrections when driving hard on a twisty road—even with Sport mode engaged. Despite these minor criticisms, BMW has effectively resolved what was arguably the greatest sin committed by this generation of the 3 Series. Keep in mind, though, that my test car had the optional variable sport steering. It is designed to provide sharper response at higher speeds while reducing the amount of steering required at lower speeds. When driven around town, the turning radius is quite tight, despite the optional 19-inch wheels, making the car easy to maneuver in cramped parking situations and when making U-turns. During testing on a hot day with temperatures approaching 90 degrees, the 340i’s optional M Sport braking components displayed just a hint of fade following miles of abuse on the downhill section of my mountain test route. A panic stop revealed plenty of strength remaining in the binders, though. The pedal is perfectly calibrated, the brakes never draw undue attention to themselves, and they always perform exactly as the driver wants and expects. Structurally, the aging 3 Series doesn’t feel as solid and robust as newer competitors. It displays a little shimmy here, a little shake there, but nothing significant, and this is only evident compared to newer competitors, such as the redesigned 2017 Audi A4. Still, this car never puts a tire tread wrong, and its handling is almost pornographic. From the smooth feel of the leather as the driver caresses the steering wheel and the firm yet gentle way the suspension damps wheel motion and controls body roll to how fluidly the shifter glides between gears, the 340i is an utterly sensual delight to drive. There is an undeniable sense of intimacy here, with both the car and the roads upon which it travels, and it is evident in mall parking lots and on twisty canyon roads alike. The 340i communicates exactly the right amount of road feel, road texture, and engine/exhaust noise to keep the driver apprised of conditions at all times, yet simultaneously filters and quells external distraction enough that it passes muster as an upscale automobile. Does the 2016 3 Series still deserve its reputation as the Ultimate Driving Machine? Yeah, I’d say so. What a 3 Series is not, however, is the Ultimate Luxury Machine. Inside, my test car lacked evidence of the traditional trappings of luxury. There was nothing plush about the car. Nothing fancy. The black Dakota leather was tautly stretched over the seats, feeling thick and durable. The dashboard and the rest of the cabin looked and felt purposeful, more like a master chef’s kitchen than a warm and inviting living space, decorated with nothing more than genuine aluminum trim. Of course, you’ve got options in terms of leather colors and trim finishes, so you can dress a 3 Series up, but none of them are luxurious in the traditional sense. Using the controls takes acclimation. To help minimize the distraction inherent in its iDrive infotainment system, BMW provides eight programmable “favorite” buttons on the dashboard. You can use these for quick access to anything within iDrive, from common phone contacts to a home navigation destination setting to favorite radio stations. I programmed them all as radio station pre-sets, but still I wished for a tuning knob. If you get the heads-up display and you wear polarized sunglasses, know that it washes out to a point where it becomes illegible. I also found that the gauges regularly appeared too dim, depending on the time of day and angle of sunlight. Both issues are difficult to accept in a car so obviously tailored for serious driving. Back on a positive note, the driving position is perfection, the steering wheel is ideally sized and shaped, and the spots where you are likely to rest or brace your legs in fast corners and curves are free of painful materials or edges. Only seat ventilation, which is not available, could have made the 340i more comfortable during a late summer heat wave. Rear-seat space is snug but comfortable for two large adults. 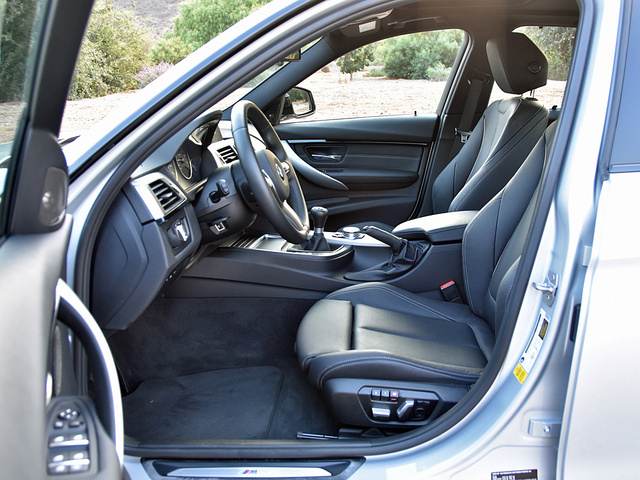 Hard trim covers the front seatbacks, making entry and exit somewhat uncomfortable to knees and shins. Once seated, passengers will find a cushion that sits high to provide proper support. Optional side window shades make the 3 Series kid-friendly, too, but due to her booster seat’s base and the location of the seat-belt buckle, my 5-year-old required help getting secured before every trip. BMW says the 3 Series has a 17-cubic-foot trunk, according to SAE standards. That number, however, appears optimistic, especially in comparison to a typical midsize sedan. Since SAE standards for trunk volume have been updated multiple times since they were first drafted in 1963, it is clear that BMW uses one of the more favorable versions to measure trunk space. In any case, you can load a couple of full-size suitcases and a compact folding stroller into the trunk, along with duffel bags and backpacks. A trunk net anchors smaller items to the floor, a nod to how important it is to secure items for energetic driving. BMW was among the modern infotainment-system pioneers when it introduced iDrive in 2001. By pairing a handful of buttons around a control knob mounted to the center console with a display screen at the top of the dashboard, the idea was to minimize controls and distraction while maximizing feature content. Naturally, people hated it. In response, BMW set about improving it. Now, with infotainment systems installed in almost every vehicle on the market, people expect this kind of technology in a new car. Whether they like it or not is open to debate. This year, iDrive’s navigation system is improved, BMW promising that it starts up quicker, calculates routes faster, and features software that can be updated over Wi-Fi. Personally, I find iDrive more intuitive and easier to use than ever. That, however, does not mean that I’m completely happy with it. And for the life of me, I can’t understand why BMW steadfastly refuses to add a tuning knob to the dashboard’s center control panel. Doing so would improve both ease of use and aesthetics, and it would further minimize interaction with iDrive and driver distraction. The bottom line is this: Nothing that the driver uses on a regular basis ought to be embedded within the iDrive system or the driver-information display between the gauges. While iDrive is included in every 3 Series, my 340i test car’s standard Harman Kardon Surround Sound stereo and its one free year of satellite radio is optional for the 328d and 328i models. Navigation, BMW Online, BMW Apps, and a heads-up display are included in the optional Technology Package. Enhanced Bluetooth with smartphone integration is also an option. Another new technology offered for the 3 Series is a parking assistant that steers the car into parallel and perpendicular spaces. My test car did not have it, and no self-respecting car enthusiast would pay extra for it. In my experience, these systems take an inordinate amount of time to identify a large enough space and then to get the car into that space. If you can’t park your own car, find another way of getting yourself around town. A reversing camera is optional for the 2016 BMW 3 Series, bundled with parking sensors in the Driver Assistance Package, which adds $950 to the cost of the car. Seriously? A reversing camera comes standard on a Honda Fit, but a BMW buyer pays extra? How does that qualify as luxury? Additionally, a Driver Assistance Plus Package ($1,700) adds several safety technologies. It includes forward collision warning with pedestrian detection and low-speed automatic emergency braking, a lane-departure warning system, an active blind-spot information system, and a 360-degree camera view system. What safety features might be included in the base price, other than those mandated by law? BMW Assist eCall technology, complete with enhanced automatic collision notification and an SOS emergency request button. If there’s room for improvement on the safety front, it is related to this car’s Marginal crash-test result in the small overlap frontal impact test conducted by the Insurance Institute for Highway Safety (IIHS). While this mediocre result is to be expected from an older design, BMW really ought to have made changes as a part of the car’s refresh to enhance this aspect of the car’s safety performance. With that said, the 3 Series turns in a nearly flawless performance in terms of other crash-test assessments conducted by both the federal government and the IIHS. Annually, BMW and Mercedes-Benz race one another to see which company can chalk up more sales in a given year, in the process becoming the best-selling luxury brand in America. This competitiveness ensures that certain versions of the BMW 3 Series represent strong value, if only because the lease payment is unexpectedly affordable. Attractive leases, combined with free scheduled maintenance for the first 4 years or 50,000 miles, make a 3 Series compelling from a cost-effectiveness standpoint. While this is an important consideration for the average luxury car customer, there is another angle to consider when it comes to this BMW’s value equation, and that relates to the sheer enjoyment that a person who loves to drive can derive from a 3 Series. Over the course of my 20-year career, I’ve enjoyed the great pleasure of driving a number of 3 Series models, starting with a memorable 1996 328i sedan that served as my BMW baptism. All of them have represented the benchmark against which all sport sedans are measured. What I consistently find with BMW products is that they foster a close relationship between the car, the driver, and the environment. Distraction is minimized. Communication is maximized. It’s just you, the BMW, and the road ahead. To an enthusiast driver, this is the Holy Grail. To your average luxury car buyer, all that matters is the BMW badge, and what it conveys. If BMW weren’t sharply focused on building Ultimate Driving Machines and weren’t so clearly successful in its quest, that blue-and-white badge probably wouldn’t carry nearly as much enthusiast credibility and societal cachet as it does. In turn, that credibility and cachet are what make the 3 Series so appealing to the masses around the world that line up and pay a premium for a car that isn’t any more luxurious inside or technologically advanced than a loaded Kia Optima. That sounds like a backhanded compliment, but it’s not…unless you’re buying a BMW 3 Series for all of the wrong reasons. Please, by all means, go ahead and do so. Your patronage ensures that BMW will be able to continue building this dynamically satisfying automobile. 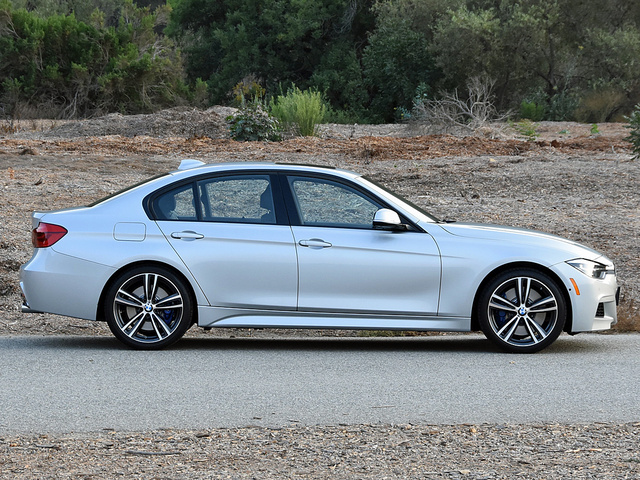 What's your take on the 2016 BMW 3 Series? 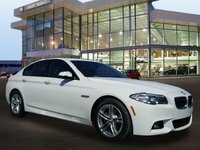 Users ranked 2016 BMW 3 Series against other cars which they drove/owned. Each ranking was based on 9 categories. Here is the summary of top rankings. Have you driven a 2016 BMW 3 Series? Any Feedback On 2016 SULEV 318xi? Worried about excessive repair costs. Comes with 2 years left on CPO but stories about earlier (2009-2015) SULEV editions are a concern. Has anyone had any issues with their 2016 BMW 328i not braking or accelerating without warning after fully stopped?